Review the following recommendations to help ensure the success and stability of your MicroStrategy system and projects when upgrading to the latest version of MicroStrategy. Follow the upgrade order and recommendations outlined in this section, in particular the upgrade checklist found at The Upgrade Process Checklist in the section below. In particular, always upgrade Intelligence Server prior to upgrading client applications such as MicroStrategy Web or Developer. Create an upgrade test environment by duplicating your production environment and production metadata. Upgrade this test environment and test it before upgrading your production environment. Do not downgrade MicroStrategy products or components on a machine to previous versions if you have already installed the most recent version of another MicroStrategy product on that machine. All MicroStrategy products on a machine must use the same version of MicroStrategy. Do not install or upgrade only some MicroStrategy 9.3.1 products on a machine containing older versions of other MicroStrategy products. Avoid installing MicroStrategy products using services such as Windows Terminal Services, which create a virtual session on the host machine. Always install MicroStrategy directly on the server machine’s physical interface, or by using a remote connection tool (such as Microsoft Netmeeting or Virtual Private Network) that takes full control of the server machine’s interface. If you are using clustered Intelligence Servers, then to retain stability in your Intelligence Server cluster while upgrading, shut down Intelligence Server on all nodes in the cluster before proceeding with the upgrade. For more information about clustering Intelligence Servers, see the Clustering chapter in the System Administration Guide. Every node in the MicroStrategy cluster must run the same version of MicroStrategy for the cluster to work properly. The upgrade process described in this section involves the following high-level steps. To help ensure a successful upgrade, follow these steps in the order they are presented in this section. Preparing a MicroStrategy system for an upgrade involves reviewing information specific to your version upgrade, pre-upgrade information and prerequisites, checking for supported warehouse data types, and backing up the production metadata. It may also involve creating an upgrade test environment that duplicates your production environment. 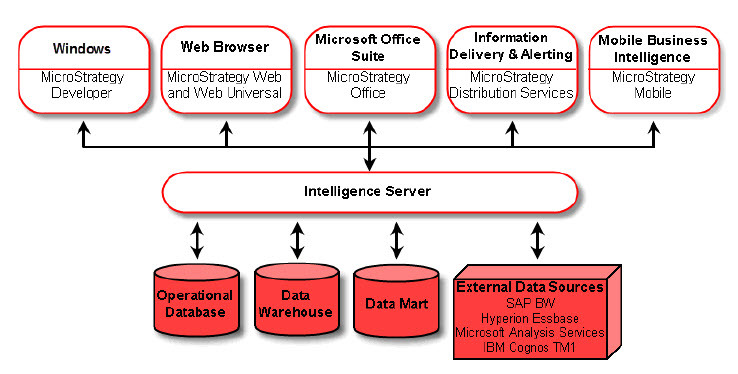 In this step, you install and configure MicroStrategy Intelligence Server Analytics Enterprise and MicroStrategy Developer Analytics Enterprise on a test server and then establish a connection to your production metadata. In this step, you update the metadata version of your production projects using the test server environment. In this step, you perform basic testing to ensure the stability and efficiency of Intelligence Server and your updated projects. Once you are satisfied with the status of the latest version of Intelligence Server, and have updated the projects in your test environment, you install Intelligence Server in the production environment. With the latest version of Intelligence Server installed in your production environment, you now install and configure the remaining MicroStrategy products in your production environment. After upgrading to the latest version of MicroStrategy, you perform several post-upgrade tasks such as testing the system, activating your installation, checking system licensing and functionality, managing user privileges, and optimizing your MicroStrategy system. What are the negative impacts of downgrading MSTR into previous version in the same machine? Is downgrading by uninstalling previous version then install new version on the same machine still has negative impact? About the software downgrade, you should read the public technote 12628 (https://resource.microstrategy.com/support/Authoring/DisplayTN.aspx?tnkey=12628&formatted=1): in short, “Downgrading an installation of Microstrategy software to an earlier version is problematic” due to registry keys not reverted by the older version installation, yielding various incompatibility errors depending on several factors. Downgrading a metadata, instead, is simply not feasible: even though it is possible to remove the current version and install an older version, it will not be able to correctly operate on a higher version metadata. P.S. : I read now your post on MicroStrategy Discussion Group – two suggestions: 1) if a simple migration from 9.3.0 to 9.4.0 is not a viable solution 2) uninstall 9.4, restart the server, delete MicroStrategy registry + a registry clean, and finally install 9.3.0. I like that we have a good discussion started here and group members are willing to help each other. That is what makes us a community. Irlando: If there are additional questions related to this you have, please post here and Stefano and I can try and answer them (or anyone else who would like to contribute).